Designed as deluxe tax filing software for investors and homeowners, this downloadable Windows version of H&R Block 16 Deluxe helps makes it easy for you to complete your federal tax form. It offers five free federal e-files for your personal return, provides step-by-step Q&A and guidance on more than 350 credits and deductions, and allows your W-2, 1099, and last year's tax return to be imported from TurboTax or Quicken. When compared to the Basic version of this software, additional features include reporting assistance on income from investments, stock options, home sales, and retirement, guidance on maximizing mortgage interest and real estate tax deductions, and the valuation and optimization of charitable donations via DeductionPro, all so that you can maximize your refund. During the process, if you have any questions, H&R Block offers unlimited tax advice from experts via online chat. Once finished, this software automatically checks your return for accuracy to avoid audits. If you are audited, an H&R Block tax professional will represent you at no extra cost. 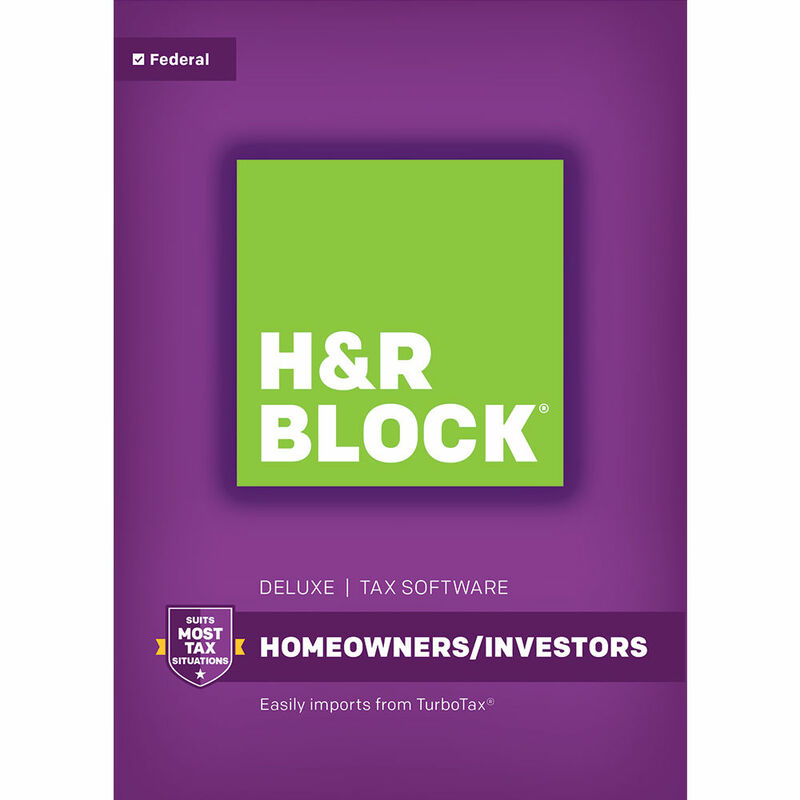 For an additional fee, you can also process your state tax within H&R Block 16 Deluxe. Step-by-step Q&A and guidance on more than 350 credits and deductions. Import your W-2, 1099, and last year's tax data from H&R Block, TurboTax, or Quicken software. Itemize deductions with Schedule A. Accuracy Review checks for issues and assesses your audit risk. Five free federal e-files for your personal return, and unlimited federal preparation and printing. This software will guide you through selling stocks, bonds, and mutual funds, as well as report dividends or capital gain distributions. You can report income from your retirement plan and rollovers, payments from your IRAs, 401(k)s, annuities, disability, pension, life insurance proceeds, and more. Guidance on maximizing deductions for home mortgage interest and real estate taxes. DeductionPro will help you track and report donations such as money or clothing to a local charity, or mileage for volunteer work so you can optimize tax savings. Refund Reveal, explains changes in your refund amount each step of the way. Whether you're getting married, having a baby, going to college, or just scored your dream job, H&R Block will give you advice for key tax benefits. i haven't received the link for my download?